Here you can buy your favorite Justin Timberlake items! Justin Timberlake T-shirts, Justin Timberlake Photographs and a lot more! 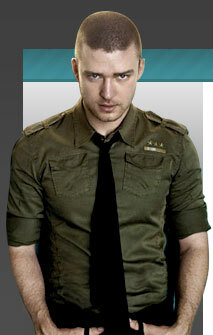 We also have a collection of Justin Timberlake Posters, you can view them here. Plus we have a huge collection of all of Justin's music CD's take a look at them in the music section. If you are looking for the *NSYNC store you will find it here. From his adolescence on Disney's The Mickey Mouse Club through his coming of age in the hugely popular boy band 'NSYNC, Justin Timberlake became one of the 1990s biggest heartthrobs, and everything from his romance with Britney Spears to his love of fast cars turned into headline fodder. But as the Teen Beat phenomenon wanes, 'NSYNC's most popular member has wisely chosen to attempt the leap from teen idol to credible solo artist. And he stands a good chance of successfully navigating that chasm - his debut CD features a more adult, R&B-influenced vibe that relies heavily on the production savvy of Timbaland and the Neptunes. Timberlake's "solo sound" feels like a natural progression, and shouldn't alienate the 27 million people who bought 'NSYNC albums. That is to say, it's different, but not too different.